In latest news, comedian Azeem Banatwalla has taken a significant step in ensuring that society doesn’t refrain from doing their bit for the people suffering with mental health issues. He was encouraged by his wife Sana Khan who in association with him has started a podcast called Senti-mental. Therein, they discuss about this disorder in a normal fashion, without making it sound like an exaggerated ailment. In its first episode, comedian Neville Shah features as a guest. They have plans of roping in more actors and comedians to bring this issue to light. However, in case you missed, Azeem Banatwalla’s second Amazon Prime Special is here, and is called ‘Problems’. He is at his finest and you cannot afford to miss his unmatched form and confidence. There are no two thoughts about it that his observational skills are excellent and he puts across his narrative in a well conceptualized fashion. 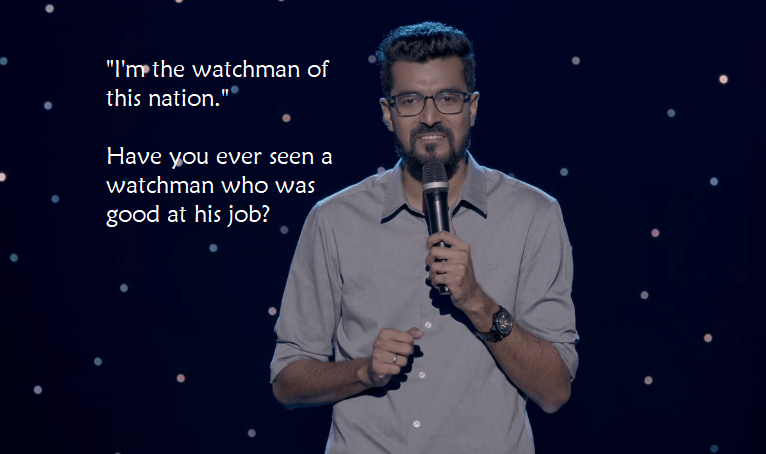 In this video Azeem Banatwalla talks about the real meaning of being a #Chowkidar. It’s topical, it’s funny! Here’s a sneak peak into the world of our chowkidar leader and the sub-titles that are equally funny to complement it. Like it? Now watch the complete video on Amazon Prime Video.